April 2, 2019 By Leroy Thompson & filed under All Articles, Long Guns, Tactics/Training. Thompson fires Maadi from standing rest. 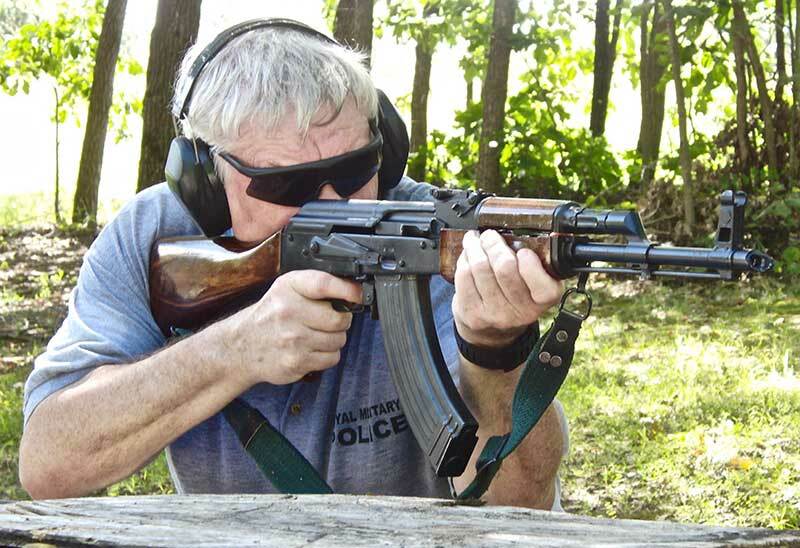 For many who weren’t buying semi-auto rifles 35 years ago, it’s hard to imagine that the ubiquitous AK-47 was virtually unobtainable then. For those of us who wanted an AK-type rifle, the earliest choice was the Finnish Valmet M62, a fine AK-based rifle but not really that similar to a Cold War AK-47. For that we had to wait until 1982, when Steyr imported about 2,000 semi-auto Egyptian Maadi AK-47s. As the Soviets had set up the plant for the Egyptians, the Maadi resembled the Russian AKM. This was so much the case that Maadis were used in the film Red Dawn. The Maadi was manufactured at “Factory 54,” the Maadi Company for Engineering Industries in Cairo. Egyptian technical staff were trained in the Soviet Union, and Russian advisors worked at the plant. Russian involvement with the Maadi ceased when the Soviets were expelled from Egypt in 1972. 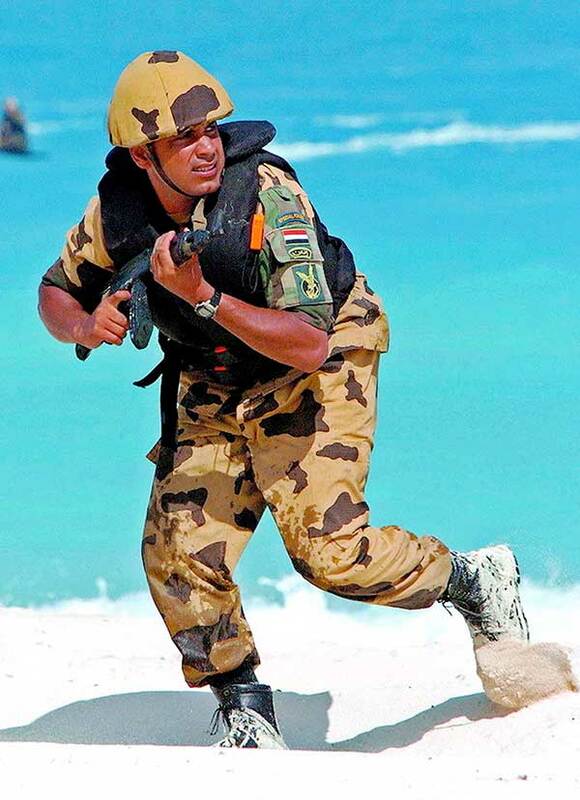 As mentioned above, the Maadi was very close to the Russian-produced AKM. Wood furniture was imported from Finland. 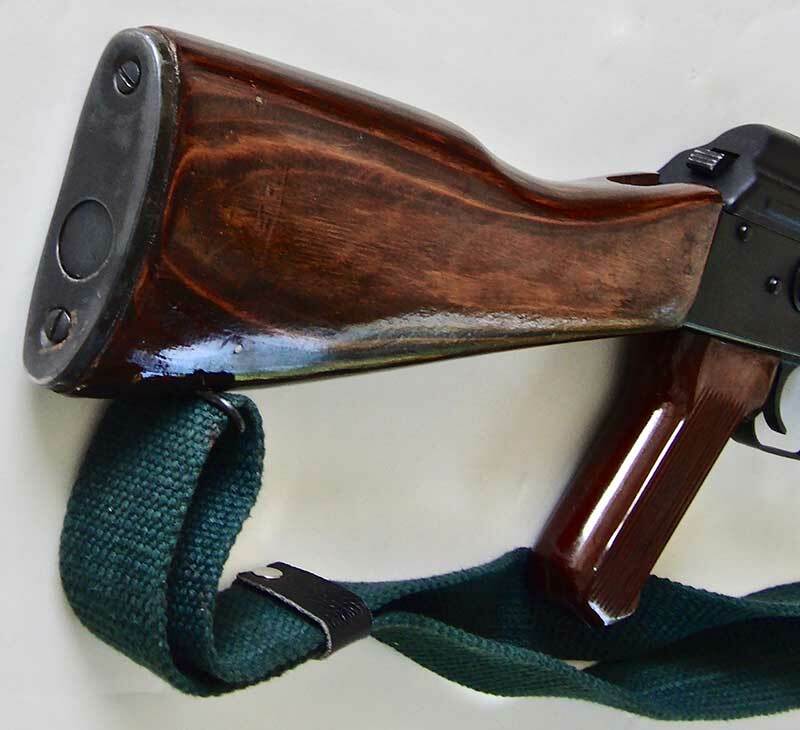 The buttstock and handguards are of proper laminated wood type, and distinctive steel pins for reinforcement are in the same position on the stock as on a Russian AKM. The magazine guide recesses on each side of the receiver are also typical of the AKM. Important because much of the 7.62x39mm ammunition available for many years was corrosive, the Maadi had a chrome-lined barrel. The ban on imported semi-auto rifles in 1989 prohibited further importation of the true Maadi. However, circa 1993 to 1995, some “politically correct” Maadis were imported with thumbhole stocks and barrels with the threads turned off. Others had a threaded barrel with a muzzle nut tack welded in place. PARS Maadi evaluated for this article. One importer was PARS International Corp. At some point, some PARS Maadis had a Russian-type flash hider tack welded in place. They also have the correct Maadi stock with pistol grip. Although I have seen multiple Maadis of this type, I don’t know at what point they received the correct buttstock, pistol grip, etc. I’m sure at least some were returned to proper configuration after the federal assault weapons ban sunset. The one I shot while writing this article is of this type and closely resembles the true Soviet AKM. Century Arms also reportedly imported Maadis circa 1997 to 1999 and assembled them from parts kits. Based on my research, Century assembled MISR-90 rifles that used Maadi receivers with trunnions, rails, trigger guard, and mag catch installed with Chinese MAK-90 parts kits. Maadi’s stock and buttplate. Note cross pins in the stock, and nicely laminated wood. At this point, AK receivers were not being made in the USA, hence the use of Maadi receivers. Some alterations had to be made to mate the Maadi receiver with the Chinese parts kits. Later imported Maadi receivers did not have a front trunnion installed, and rivets were located to allow the Chinese parts to be installed more easily. 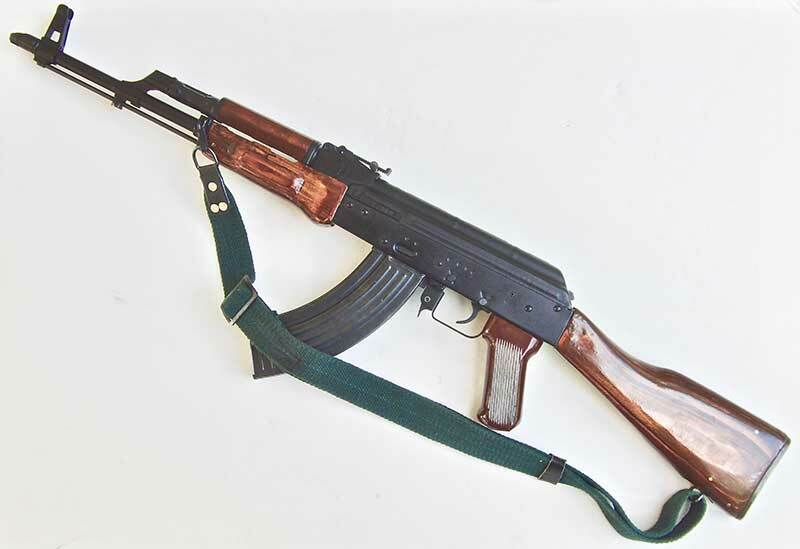 Some sources state that export Maadis normally had black plastic grips, while the brown ones were used on military ones. However, parts kits could be found with either color. Most Steyr and PARS Maadis I’ve encountered actually have had brown grips. An especially rare import Maadi was one from Interport, Utah, circa 1986 that came with both a steel folding buttstock and a wooden one. A brochure from the time lists its price at $995.00. Only 50 were reportedly imported. I’ve never actually seen one of those but know they’re sought by collectors, as are original Steyr Maadis. In 2017, one in nice condition but not in the box sold for $3,450 at a Rock Island Auction Service. Out of curiosity while working on this article, I checked GunBroker and saw two of the thumbhole stock Maadis, one at $830 with four bids and the other at $1,199 with one bid, both in the box. Since I view those thumbhole stock rifles as symbols of oppression, I find those prices amazing, but presumably they appeal to collectors. A friend has one of the PARS Maadis just like the one I used to own, so I asked him to bring it along when we were shooting. I put 40 rounds each of Federal 124-grain FMJ, Red Army Standard 123-grain FMJ, and Golden Tiger 124-grain FMJ through it. It functioned flawlessly with all the ammo. Maadi’s handguards are also proper laminated wood type. I have shot Russian AKMs and it does resemble one. I especially like its wood. The flash hider was tack welded but it looked correct. When I sold my similar one, I got $1,200 for it, so feel I was well compensated. I have a Polytech Legend that I’ve been shooting for 25 years or so. It’s probably fired at least 1,000 rounds for each year I’ve had it. I also have a Norinco underfolder that I’ve had for many years. I don’t shoot it as much, but along with the Polytech, it satisfies my needs when I want to shoot an AK. Having said that, I do like the Steyr Maadis. Just as The Walking Dead helped raise the price of Colt Pythons, the association of the Maadi with Red Dawn may make the Maadi more appealing to some shooters. While writing this, I tried to decide if I would buy a nice example of one of the original 2,000 Steyr Maadi imports. My answer would be a qualified yes, but not at $3,450!